The Sandovals of Brea almost gave up hope when Beatriz was diagnosed with breast cancer. Their frozen embryo made parenthood a reality after successful treatment. She’s known as the “miracle baby,” but little Sofia Margarita Sandoval, born December 26th, 2004, only knows she is very much loved. Her parents, Beatriz Sandoval, 38, and Jorge, 39, nearly gave up hope of ever having a baby, due to Beatriz’ battle with breast cancer in 2000. At 32, Beatriz discovered a lump in her left breast. Doctors and tests confirmed the lump was malignant. A mastectomy and lympectomy soon followed. Aware that the Sandovals were anxious to have a baby, Beatriz’ oncologist suggested they confer with a fertility specialist. His concern was that chemotherapy could cause ovarian damage, and end the couple’s hopes of ever conceiving a baby. “The news was more devastating than learning I had cancer.” said Beatriz. That realization brought them to the Dr. Lawrence Werlin, founder und director of the Coastal Fertility Medical Center in Irvine. Dr, Werlin suggested in vitro fertilization using eggs extracted from Beatriz and fertilized by Jorge. Then the fertilized eggs, or embryos, were frozen and stored at the clinic, awaiting when Beatriz would be cancer-free, and ready to attempt pregnancy. “We had 11 frozen embryos stored,” said Bea1riz. But getting pregnant was still a long ways off, if ever. First she had to survive the ordeal of multiple rounds of chemotherapy und radiation treatments. Finally, after nearly five years without cancer reoccurrence, her doctors felt she could safely try to get pregnant. 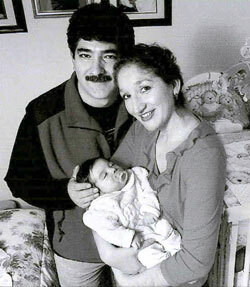 “I had a wonderful pregnancy,” said Beatriz, who added that she is nursing Sofia, but supplements with formula. Dr. Werlin said the clinic stores hundreds of frozen embryos for patients not yet ready for pregnancy. Two patients have stored frozen embryos at the clinic for more than 13 years. That most likely will not be the case with the Sandovals who are already thinking about a brother or sister for little Sofia.